Response time – or latency – is crucial to understand in detail, but many common presentations of this metric hide important details and patterns. 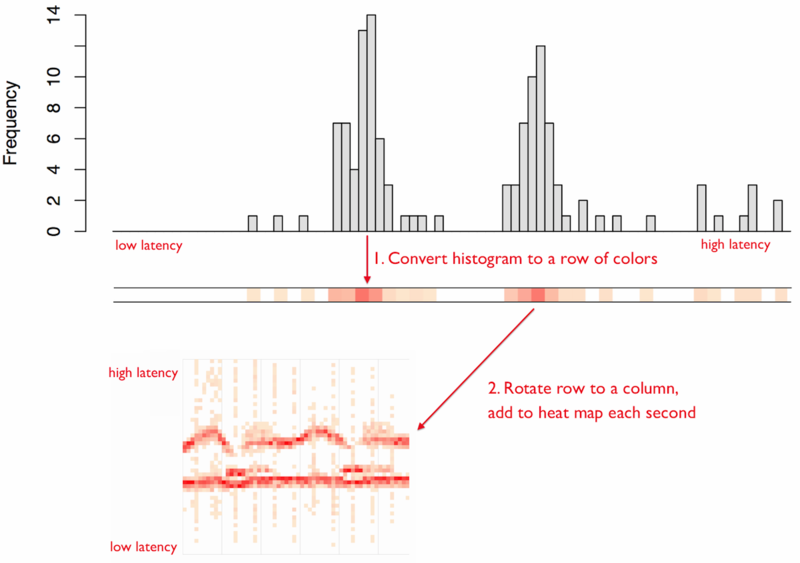 Latency heat maps are an effective way to reveal these details: showing distribution modes, outliers, and other details. I often use tools that provide heat maps directly, but sometimes I have separate trace output that I'd like to convert into a heat map. To answer this need, I just wrote trace2heatmap.pl, which generates interactive SVGs. 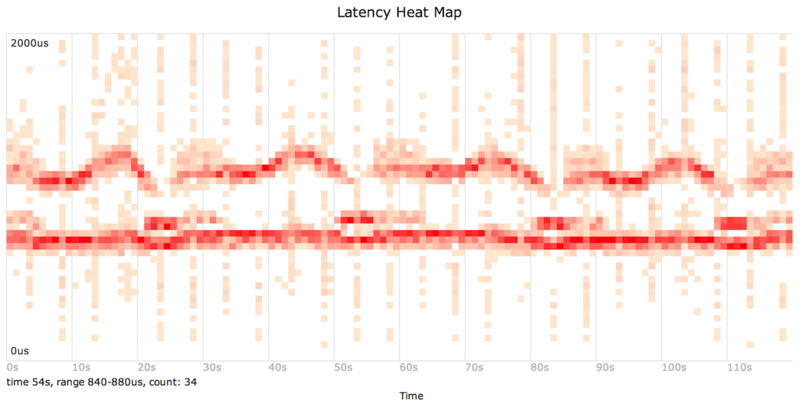 I'll explain latency heat maps on this page by using disk I/O latency as an example. As an example of disk I/O latency (aka storage I/O latency), I have a single disk system with a single process performing a sequential synchronous write workload. The storage device is a hard disk (rotational, magnetic). While this sounds like a very simple workload, the resulting latency profile is more interesting than you might expect. I could plot this average latency as a line graph, which varied between 3 and 9 ms in the above output. This is what most monitoring products show. But the average can be misleading. Since latency is so important for performance, I want to know exactly what is happening. To understand latency in more detail, you can use my biosnoop tool from the bcc collection for Linux, which uses eBPF. I've written about it before, and I developed a version that uses perf for older Linux systems, called iosnoop in perf-tools. biosnoop instruments storage I/O events and prints a one line summary per event. I/O latency is the "LAT(ms)" column. Individually, the I/O latency was usually less than 2 milliseconds. This is much lower than the average seen earlier, so something is amiss. The reason must be in this raw event dump, but it is thousands of lines long – too much to read. This shows that the average has been dragged up by latency outliers: I/O with very high latency. Most of the I/O in the histogram was in a single column on the left. This quickly creates a list of I/O taking longer than 50 milliseconds (I used $NF in the awk program: a short-cut that matches the last field). The I/O distribution is bi-modal. This also commonly occurs for latency or response time in different subsystems. Eg, the application has a "fast path" and a "slow path", or a resource has cache hits vs cache misses, etc. But there is still more hidden here. The average latency reported by iostat hinted that there was per-second variance. This histogram is reporting the entire two minutes of iosnoop output. Not only is this bi-modal, but the modes move over time. This had been obscured by rendering all data as a single histogram. 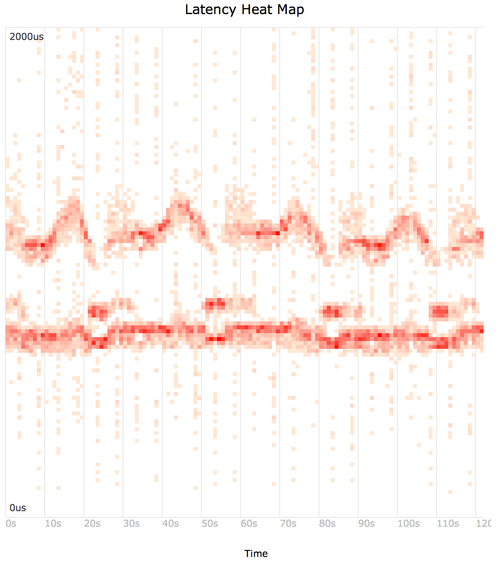 Using trace2heatmap.pl (github) to generate a heat map from the iosnoop output. Mouse-over for details, and compare to the animation above. If this embedded SVG isn't working in your browser, try this SVG or PNG. This feeds the "TIME(s)" (end time) and "LAT(ms)" (latency) columns to trace2heatmap.pl. It also converts the latency column to microseconds (x 1000), and sets the upper limit of the heat map to 2000 microseconds (--maxlat). Without "--grid", the grid lines are not drawn (making it more Tufte-friendly); see the example. trace2heatmap.pl gets the job done, but it's probably a bit buggy – I spent three hours writing it (and more than three hours writing this page about it! ), really for just the trace files I don't already have heat maps for. You can also see my summary for how heat maps work, and my longer article about them: "Visualizing System Latency" (ACMQ, CACM). A heat map is similar to a scatter plot, however, placing points in buckets (the rectangles) rather than showing them individually. Because there is a finite number of buckets in a heatmap, the storage cost is fixed, unlike a scatter plot which must store x and y coordinates for every data point. This can make heat maps suitable for visualizing millions of data elements. Detail may also be seen beyond the point where a scatter plot becomes too cluttered. For the example problem above, I instrumented latencies on Linux using eBPF. There are a number of tracers in Linux that can generate per-event latency data, suitable for turning into latency heat maps. The Linux built in tracers are ftrace, perf (aka perf_events), and eBPF. There are several add-on tracers as well, and I used the bcc add-on for eBPF above. You may also use per-event latency data generated by application code. It should not be hard to get latency details from other modern operating systems using tracing tools. Applications can also be modified to generate per-event latency logs. This feeds the "TIME(us)" (end time) and "DELTA(us)" (latency) columns to trace2heatmap.pl. The histogram images and heat map shown in this page were actually generated from DTrace data on a Solaris system. I've since updated this page to cover Linux and FreeBSD. If you want to add heat maps to your monitoring product, that would be great! However, note that tracing per-event latency can be expensive to perform, and you will need to spend time understanding available tracers and how to use them efficiently. Tools like eBPF on Linux, or DTrace on Solaris/BSD, can minimize the overheads as much as possible using per-CPU buffers and asynchronous kernel-user transfers. Even more effective: they can also do a partial histogram summary in kernel context, and export that instead of every event. On older Linux, you can create perf_events heat maps, although without eBPF it requires passing events to user space for post processing, which is more expensive. Other tools (eg, strace, tcpdump) are also expected to have higher overhead as they also pass all events to user space. This can cause problems for production use: you want to understand the overhead before tracing events. It is possible to record heat map data 24x7 at a one-second granularity. I worked on Analytics for the Sun Storage Appliance (launched in 2008), which used DTrace to instrument and summarize data as in-kernel histograms which it passed to user space, instead of passing every event. This reduced the data transfer by a large factor (eg, 1000x), improving efficiency. The in-kernel histogram also used many buckets (eg, 200), which were then resampled (downsampled) by the monitoring application to the final desired resolution. This approach worked, and the overhead for continuously recording I/O heat map data was negligible. I would recommend future analysis products do this approach using eBPF on Linux. See the background description on may heat maps main page, which describes the origin of latency heat maps and links to other heat map types. Thanks to Deirdré Straughan for helping editing this page.